Are you a visionary of the stage? Or maybe you’ve just always wanted to try directing? Either way, Backstage has the tools to help thespians achieve their directing dreams. This site’s casting notices include opportunities for more than just actors; writing, film crew, and stage management gigs regularly surface, as do various jobs for theater directors. Aspiring helmers in New York City, Los Angeles, Chicago, and Atlanta in particular should keep their eyes peeled when browsing Backstage casting listings. Use the “Production Type” filter on our casting calls page. After pulling down the menu and selecting “Stage Staff & Tech,” click “Search” (or “Save Search” if you’d like to come back to this filter) and exciting gigs for directors and other theater artists will be listed below. 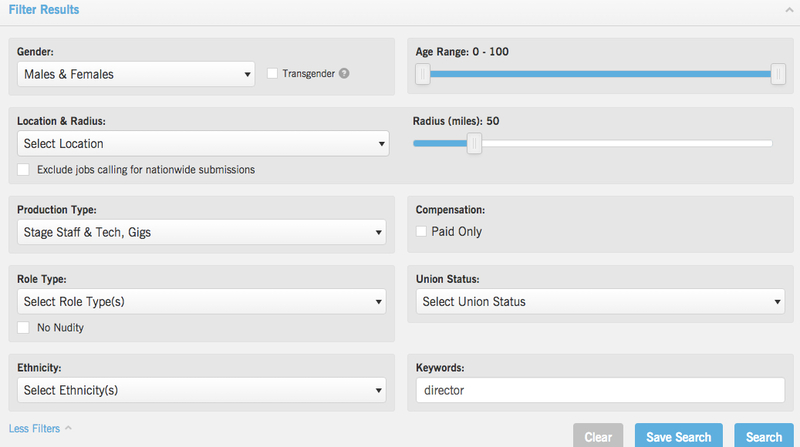 You can even narrow results further by typing “director” or “directing” into the “Keywords:” box. As you comb Backstage for assistant director or festival gigs and begin to reach out to potential collaborators, here are a few pointers to keep in mind. Below we’ve rounding up advice on launching a career in directing theater from some of the industry’s most illustrious professionals. Work with people you admire. Three-time Tony Award–winning director Jack O’Brien (“Hairspray,” “It’s Only a Play”) has experience directing everything from William Shakespeare and Tom Stoppard to blockbuster musical theater. Aspiring directors, he says, need only find collaborators they get along with both artistically and personally. Don’t be afraid to create opportunities to work with similar creatives you admire, or simply ask them. And let the learning process begin. A directing career is a road, not a ladder. “I get to take things that were previously in one dimension and put them into three dimensions using my imagination and intellect and people skills,” Senior also says. Directing theater is unlike TV or film, where things are a bit more clear-cut. Working as a freelance stage director, she says, is a road—not a ladder. “I’ve never seen this career as something vertical. I’m just as thrilled to work in a basement as I am on Broadway. Take great care to cast the right actors. The same goes for actors, some of a director’s most intimate collaborators. During a show’s audition process, Hedgepeth looks for actors who have plentiful and continuous training. “Your body and your voice are the only tools you have to create characters. They need to be constantly exercised, further trained, and challenged. You can always be better; you can always be stronger.” Cast actors who demonstrate an understanding of that concept and who are determined to continue growing their talent onstage. Experiment and play, but make clear choices. To stay abreast of directing opportunities, save searches on Backstage’s casting filters. As you continue to study great theater and begin exercising those directing muscles, check out our articles full of advice and insight from industry professionals. Using Backstage as a resource, the directing world will be your oyster! Explore the rest of our new audition listings! And for more advice, check out Backstage’s YouTube channel!